After five years of studies of Thai orchids, orchid trade and national parks, Dokmai Garden launched The Orchid Ark on April 3, 2011. The orchid Ark is a contribution to the efforts in saving the wild monsoon orchids, and you can help too. Read more here! This blog, The Last Days of the Orchids, will be the permanent discussion forum where you can share experience about monsoon orchid cultivation and orchid habitat preferences, submit reports, observations, corrections and suggestions. It is important for future generations to know what was going on during the last days of the orchids, and it is important for future generations to know that they actually had a fantastic landscape in their neighbourhood, ruined by the 20th century generations. We hope Dokmai Garden’s Orchid Ark will constitute a glimpse of hope. We the founders are looking forward to a long and successful collaboration with orchid lovers worldwide. 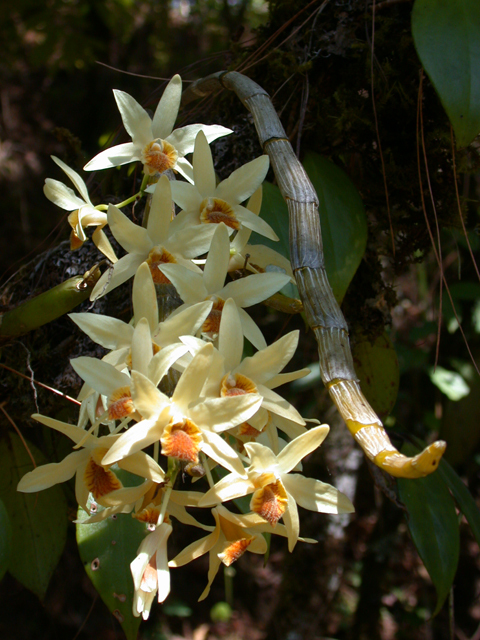 Without a determined plan, deforestation, fires and theft will wipe out a sight like this: Dendrobium heterocarpum (Orchidaceae) in blossom in a forest. The picture is from one of the Dokmai Garden jungle expeditions. The work that you’re doing with the Orchid Ark is incredibly important; I only hope that others around the world follow your example. The number of wild species lost to poaching and habitat loss is tragic, and unfortunately, not very well publicized. Good luck in your endeavors to raise awareness, and in protecting what natural resources remain! While waiting for a haircut on Saturday, I looked at the front page of a Thai newspaper. It showed images of illegal logging in Pai district, Mae Hong Song province. Can you send a large dump truck to the area to collect the epiphytic orchids from the crowns of the cut trees. Please hurry because soon hill tribe people will cut the branches for firewood and sell the orchids on the the illegal markets. Thank you for your report which we very much appreciate. Indeed we try to get a salvation picking permit from the Department of National Parks, Wildlife, and Plant Conservation (DNP). Since such a picking permit is new to the authorities, I am afraid it will take a long time. However, thanks to the Orchid Ark the process has begun. We just spoke with Mr Somkiat at Department of National Parks, Wildlife, and Plant Conservation (DNP). He said he learnt about the Pai tragedy too, and he is now negotiating with CITES about Dokmai Garden’s salvation permit. The CITES representative Mrs Som phoned us and we explained this is not a commercial endeavour. She proceeds with interior discussions. We are also most grateful to Dr Suyanee at the Queen Sirikit Botanic Garden who put us in contact with the correct agency (DNP). Mrs Som referred the issue of a Salvation Picking Permit to Mr Pajon Sitikan at the Forest Resource Management Bureau Number 1 in Chiang Mai. He said he would try to help us. The authorities are now aware that salvation picking permits are needed. As to the epiphytic orchids which are now dying on the ground in Pai, we can not do anything legally. We should also add the encouraging news that Sidney Botanical Garden and Michael Pascoe at Fanshawe College, Canada, also support the Orchid Ark. Today on the 7th of April we had a meeting with Mr Pajon Sitikan at the Forest Resource Management Bureau Number 1 in Chiang Mai. He is a kind gentleman who perfectly understands the problem, and he promised to see how he could help the Thai orchids and the Orchid Ark. Until we eventually get a salvation permit, we keep working along the original plans, i.e. use donated orchids and orchids bought from CITES certified dealers. Thank you Ann Thompson for putting us into contact with Orquidiofils Valencians, Spain. We get many questions about how to ascertain if an orchid dealer has a true CITES certificate or not. It is easy to reply “yes” when a customer asks, or show any diploma in a foreign language. We shall return to this question as soon as we have a solution. We spoke to CITES today. The paradox is that while we are all encouraged to buy orchids from CITES-certified dealers, CITES in Bangkok could not show a list of reliable companies nor show how a true certificate looks like. We asked Mrs Som straight about the orchid dealers Dokmai Garden uses, and she confirmed they were legal, but it is hard work to phone CITES everytime you want to buy a 150 Baht orchid. There should be a list on CITES home page. I think the Orchid Ark is helping the authorities realizing the problems. If any of our many readers (about 150 per day) has a good CITES contact abroad, maybe you can discuss the problem with them too, and then CITES can resolve this internally? Mudslides bring down trees carrying epiphytic orchids. Flash floods and rainy season flooding leave debris containing salvageable orchids. Even terrestrials can be found amongst the debris. I posted the link of the orchid ark to the Finnish orchid society.The chairman was very grateful and promised to forward the link to the European orchid council in France. Many thanks for your quick action. If many people collaborate we should be able to save many orchids. We thank Paul Herd of the Wellington Orchid Society in New Zealand for adding a link to our website, and for sending the link to their members. Dr James Wearn at the Royal Botanic Gardens in Kew has circulated the information about the Orchid Ark among his colleagues. We are looking forward to a fruitful exchange of knowledge. Mr Trey Sanders, a Dendrochilum expert from Bristol, is engaged in biodiversity lectures and has already promoted the Orchid Ark. Debbie Thomas from Cheltenham, creator of the most useful orchid site justtropicals.com, also support and link to Orchid Ark. Today the 6th of April is a national holiday, so most governmental employees do not work, except devoted botanists: Dr Piyakaset from the Queen Sirikit Botanical Garden gave us further advice on the issue of a salvation picking permit. The chairman of the Netherland’s Orchid Society, Hans Vastenhoud, and Gab van Winkel, editor of Orchideeën, welcome the orchid Ark initiative and they will write about it in the upcoming issue of the orchid journal Orchideeën. We are very grateful for this support and we are looking forward to an interesting collaboration. Today we got support from the Spanish orchid society Orquidiofils Valencians (OVAL). We also contacted CITES international in Geneva to see if they could support their Thai colleagues. Today we got support from the New Brunswick Botanical Garden in Canada and Royal Botanic Gardens Melbourne in Australia. I also noted new orchids in blossom at Dokmai Garden: Chiloschista viridiflava and Dendrobium aphyllum. Our pollinations are successful, we are going to have a large collection of seeds and fruits of many orchid species. We urge our readers to spread the message about the Orchid Ark, so that we can raise funds and establish the orchid laboratory when the fruits are ripe (the building is up, we just need equipment). Today we had a discussion with Dr Nura Abdul Karim at the Singapore Botanic Gardens. She explained that their new director will not begin until August, but she will brief him about the orchid ark when he has settled in. Her view is that legal seed and plant exchanges are welcome by all botanical institutions and is one form of safeguarding the gene pool of wild species. Also how about organizing Orchard rescue missions. After a storm in the forest often bits of branches fall down dooming orchids which are not picked up off the ground. Once I picked some up on Doi Suthep and the rangers said to take them home. Instead I persuaded them to put them on some trees near their station. A splendid idea! Putting them back is not criminal, and it does help the orchids, and we learn more about their habitat preferences too. This is just an update. Two days ago we received a question (again) how a buyer of orchids in Chiang Mai would know if the dealer is CITES certified or not. As there are more illegal vendors than legal, this question is important. Unfortunately, we have not received any response from CITES so the question remains unsolved. The Orchid Ark has received many plant donations from private garden owners, and also books, and we encourage people to keep calling us. We still need to make essential investments in laboratory and irrigation so financial contributions are welcome too. The coming few weeks will be devoted at identifications and the creation of a detailed database. Ketsanee is working hard making the Orchid Ark known among educated Thais, so we have scheduled for a brainstorm with orchid book author MSc Nantiya Vaddhanaphuti for tomorrow. Today we visited MSc Nantiya Vaddhanaphuti, author of the book ‘Wild Orchids of Thailand’ (Silkworm Books). She reported that her Thai edition will soon be published, and it will contain nearly 100 more species. She showed us her impressive orchid collection and she instantly and generously shared some species with the Orchid Ark, adding she would study our species list to further boost our collection with species lacking. Her collection is the result of 20 years of work. She proposed there should be an Orchid Ark for every major region in Thailand (north, northeast, west, central and south), but the obstacles are time, money, devoted directors and long perspectives. Until there is a governmental initiative we proceed with Dokmai Garden’s Orchid Ark as planned. Khun Nantiya also suggested that we should create a network of garden owners, excluding the orchid traders. She said that in addition to the Orchid Ark and her own collection, there are another two large private collections in the Chiang Mai area. We agreed it would be useful to share specimens between these and the QSBG to ensure back-ups and broaden genetic diversity. We also went through some literature, discussing the possibilities of making Seidenfaden’s publications available on-line. If we get the publishers’ permit (Dokmai Garden promised to investigate that), would anyone like to sponsor the Orchid Ark, by devoting time (or money) to scan from paper to pdf? Nantiya has these rare publications, essential to any devoted orchidologist. This is an excellent idea but unless a network garden can be legally protected, this idea will not protect the orchids. E.g. inheritance laws in Thailand (Thais and foreigners alike) allow for grabbing anything minutes after a death and without repercussions. A funeral in a Thai village often equals orchestrated robbery, I speak from experience. Each network garden should display a plaque that the orchids in the garden belong ultimately to a botanical institute like QSBG. The village head (and the local police?) must be able to seal the garden and take responsibility for the plants. Yes, if we create a network of collaborating gardens we should tell each other that we wish to share the collections in case of death or disease or sales or divorce. Each owner can write a will stating which garden gets what. The other gardens have to know about the content of the will, and so should the family, the local police and the village head. It would not hurt to file the will with an attorney with no connections to the village or family. Since Dokmai Garden is the pioneer garden we can proceed with this so there are routines. Thank you for your comment! I suggest to protect orchid collections and wildlife on private lands we need a “Land for Wildlife” scheme as operates in varoius states in Australia. Plase read about them via Google. Today we had a meeting with James Maxwell, the curator of the Chiang Mai University herbarium and one of Southeast Asia’s most experienced field botanists, and Pavlos Georgiadis, ethnobotanist. They share our concerns and James Maxwell explained the Orchid Ark is welcome to use the CMU herbarium and library for identifications and extractions of ecological data. Associate Professor Henrik Aerenlund Pedersen, Chairman of the Danish Botanical Society and lecturer at Copenhagen University, brought the valuable news that Seidenfaden’s crucial publications on Southeast Asian orchids will be made available on-line by the Biodiversity Heritage Library (www.biodiversitylibrary.org)! There is a confusion regarding copyrights, as the publisher of Opera Botanica does not exist anymore, and although the Danish Botanical Society is the publisher of Dansk Botanisk Arkiv, it is not clear who has the illustration copyrights. This will take some time to settle, but we hope that within a year an orchidologist in Chiang Rai do not have to spend five hours on a motorbike to go to the university in Chiang Mai to find literature, but instead easily consult the keys at his breakfast table! This will certainly speed up accumulation of knowledge (distribution and habitat) and numbers of serious amateur orchidologists. Many thanks Associate Professors Aerenlund Pedersen & Henning Knudsen, representative at the Biodiversity Heritage Library project! Unfortunately we have no news on this issue and many angry Thais say they will make copies anyhow and publish. These publications are urgently needed! We just received the positive news from Henning Knudsen that you can now access and download articles on Thai orchids by Seidenfaden. The files are very large so you need a quick connection. This will push Southeast Asian orchidology forward and we thank Henning Knudsen for kindly supervising this landmark. Unfortunately, I cannot fullfil this request, neither as representative of the Lund Botanical Society (the owner of the name ‘Opera Botanica’) nor as Editor-in-Chief of ‘Nordic Journal of Botany’ (the journal with which ‘Opera Botanica’ was jointly published). This since the legal rights to the issues requested are highly problematic. Up to 1980, ‘Opera Botanica’ was published as a supplement to the journal ‘Botaniska Notiser’ by the Lund Botanical Society. In 1981, ‘Botaniska Notiser’ was merged with a number of other journals to form ‘Nordic Journal of Botany’ and an agreement was reached with the Lund Botanical Society to hand over all rights to the journals ‘Botaniska Notiser’ (for a period of 20 years) and ‘Nordic Journal of Botany’ to an editorial office situated in Denmark. ‘Opera Botanica’ was not explicitly included in this agreement but in spite of this the editorial office in Denmark continued to produce ‘Opera Botanica’ in the years 1982–2005. In 2007–08 this editorial office in Denmark was liquidated and all rights to ‘Nordic Journal of Botany’ was transferred to the Nordic Society Oikos (which has since 2008 produced this journal). However, since the former office in Denmark could not substantiate the rights to ‘Opera Botanica’, that periodical could not be included in the transfer. To conclude, all issues of ‘Opera Botanica’ from 1942 to 1980 belong to the Lund Botanical Society and may be ordered from us. The name ‘Opera Botanica’ still belongs to the Society, but it has not produced any issues of that periodical since 1980. However, a number of more recent issues were published by the former office of ‘Nordic Journal of Botany’, but that office does no longer exist and ‘Opera Botanica’ was not mentioned when to rights to ‘Nordic Journal of Botany’ was transferred to its present publisher, the Oikos Editorial Office. Since the legal situation is this unclear, the Oikos Editorial Office has not dared to digitalize ‘Opera Botanica’ (as done by all old issues of Nordic Journal of Botany), and the Lund Botanical Society does not have full access to those issues produced in Denmark. Thus, the only advice I may give is to try to obtain pdf:s of these papers from some library. As far as I know these issues are not available as pdf-files from any official site. It announces the 20th world orchid conference in Singapore 13th-20th of November 2011 (http://www.20woc.com.sg/site/). A representative of the Orchid Ark should go there to announce our activities, make connections, gather knowledge. Since the Orchid Ark is all private we have no budget, it is all up to the participating individuals. Please let me know if anyone is interested in going. Today we received a friendly message from Dr Alec Pridgeon at Royal Botanic Gardens, Kew. Like us he is concerned about the illegal logging too, and he presented some ideas on how to tackle it. He will also support us with some recent literature on Pinalia, a resurrected genus formerly included in the genus Eria. On Sunday we received another big orchid collection – many new specimens and species. It will take about two weeks to mount, identify (when possible) and catalogue these. The next updated list on our orchids (www.dokmaidogma.wordpress.com/orchidark.php) will also have notes about the species considered acutely endangered. So far the response on orchid donations have been more successful than expected. We also thank the Peake family in Chiang Mai for generous financial support and hope their contribution will stimulate others as we still need some more money to launch the seed germination laboratory. Today I have revisited a site of Vanda denisoniana. At least one hundred plants with a biomass 3 can be found on the ridge. My guess is at least five hundred plants are still present. Very few are flowering. Why? The reason that they are surviving is the difficulty of the terrain and the lack of exploitable resources on this ridge. Not many people go there. You will not like the climb to the ridge. I gambled yesterday on finding a trail going down at the North end. There isn’t a trail and I took the plunge. That means letting yourself slide from one tree to the next and hope that the tree does not give way. Half way down you come in a hanging valley which once upon a time has been rain forest but now completely logged. I did not find a single orchid in this extreme moist area. Maybe it is too small. I had to give up following a creek down and climb up on another ridge to get down. Very exhausting. I have used a GPS to log all orchid species which I found yesterday. If the government wants this area to survive in the long run they have to stop the forest fires. There has been a fire on the ridge during the last dry season. There are many dead trees on the ridge. Land/forest encroachment is severe at the lower parts with rubber and fruit trees being planted. But forest encroachment is happening everywhere in this country and in the world. We plan to go ahead with the pollination study, and perhaps bring very fit tourists there. If there is an interest to see the last few fragments of Vanda denisoniana in the wild, we may later want to approach the village and explain that they can make money on tourists by NOT burning the forest. We can not ask them before we have tourists, because they will strip the trees from orchids and sell them. Asking the police and the authorities for help is a gamble because that may also result in stripping and shared profits. Comments are most welcome! In 1987 I worked on a mineral exploration project in southern Botswana. The South African owner of the trading post in Khakhea generously offered me a bedroom and the use of the living room in the house connected with the store. The trader was mostly absent and residing in South Africa. One day I returned earlier than normal from field work and found the trader and two Botswana men in the house. On the floor lay a bundle of Cheetah skins, maybe ten of them. It was obvious that the South African was buying the skins from the local hunters or traders. I pretended not to have seen anything and left them. The only way of laundering or selling these skins was by introducing them as legal South African hunting trophies. At that time Americans even hunted tigers in the South African bush. A farmer has been prosecuted for setting up such a hunt with a retired circus tiger. A few days ago I walked through a small town in northern Chiang Mai province, Thailand. An expensive pick-up car loaded with grass used as animal fodder, was parked along the road. In the middle of the grass, clearly visible, was a large plastic basket full of mature orchid plants. The plants could have been a large leafed Rhyncostylis. All the roots on the plants had been cut off at a length of 10 centimetres, a sure indication that these were bush collected plants. Trade in wild orchids still exists. How it is done, I do not know. For my own safety I pretended not to have seen the orchids. Yesterday we had a discussion with Peter Williams in Chiang Dao. We agree that orchid scouts should not be forced to reveal their orchid locations, because we know from several examples that nobody (not the tourists, not the police, not the scientists, not the local governments) can be trusted. However, we need the orchid scouts to expand data about preferred orchid habitats to be able to grow and pollinate local orchids successfully. Actual observations and photographs adds to the scattered and often insufficient literature data. It is sad the compilation of such orchid field data begins now, at the verge of the their extinction. Yesterday and this morning we had contacts with Mark Sullivan of the Orchid Conservation Coalition. We have decided to make the Orchid Ark an independent non-profit organization, and we have filed an application to join the OCC. Dokmai Garden will still host the collection. You can read more about that in tomorrow’s Dokmai Dogma blog when all details have been sorted out. Ketsanee and Eric just returned from Sweden and Norway. We welcome Kurt Keller in Chiang Dao who volunteered to become an Orchid Scout, i.e. to gather detailed information about the habitat of wild orchid species. Tomorrow Eric goes go Chiang Rai to meet with our new Orchid Ark benefactor Bruce Hugman. Eric will also pick up another Orchid donation and visit a site for wild Vanilla. He will be back again on Friday. Currently there are ten orchid species in bloom at Dokmai Garden, and many setting fruit. I am back from a most interesting stay in Chiang Rai. Bruce Hugman volunteers to keep some back-up orchids within his 35 rai land (15 acres). We need to resolve the question of safety though, as this is a land without papers. Another interesting visit was made to a Chiang Rai jungle where we saw Vanilla siamensis, which we report as a new species for the Chiang Rai province. This endangered species grows along a stream and the specimen we saw is very healthy and large, with huge fruits. In a country like Sweden you would report such a finding to the authorities, feel a bit proud and relieved you could save it from the logging machines, and maybe ask the journalists to come so they can write an article and stimulate more reports. In Thailand we fear we can not report to anyone, not even fellow Orchid Ark participants. We can only hope fire and logging will not affect it, as any publicity around it may lead to its destruction. Our previous suggestions to bring tourists to see endangered orchids can not be launched either, as we do not know who will attend such tours. International orchid thieves may raid the site a day later. We can only work towards a salvation picking permit and wait for a time when the threats are gone. This may take many decades, and meanwhile we must monitor this site and search for more specimens. Please let us know if you have another opinion. We got a kind reply from Dr John Elliott, Chairman of the 20th World Orchid Conference in Singapore in November. He will talk to the board regarding the Orchid Ark’s participation. The orchid collection has reached 196 species and I have updated the web page after kind suggestions from Mark Sullivan, the Orchid Conservation Coalition. Essentially people have sold pieces of the national park and performed extensive logging. Sine we own (legal) land in the village Mae Kanin Tai, and since that land constitutes an evergreen riverine habitat which is adjacent to the Opkhan national park, it could be fenced and used as a second Orchid Ark. Our only problem at the moment is money to develop this idea. We need a fence, a house and a person who guards the area. On an orchid blog I read that some chap in Thailand sells stolen Paphiopedilums via Facebook. I have friends who feel pity for the orchids and buy them to put them back again. You should not! Killing the demand would effectively stop the trade. Tell the police, alert people on blogs such as this one and write an article in another forum. Education must go hand in hand with rescue efforts. The Westerners are not the big problem, the Thais and the Chinese are. I saw a hilltribe lady selling Paphiopedilums too, near Doi Ang Khang where many Thai tourists go. I said it was illegal, and she looked angry and replied she ‘found’ them. Better buy her honey instead. The Orchid Ark and Kew gardens discuss the Oberonia fairy orchid genus. James Wearn explained that due to the lack of Oberonia in botanical garden collections there is not enough sampleable material for making molecular analyses. We both see the need for making a modern revision of the genus so discussions will proceed. Meanwhile we ask our donors to share their collections with us. The Orchid Ark has proposed a collaboration with the organizers (lecture, joint excursion including a small donation and a booth for information & collecting money). We thank Dr Karel Petrzelka from the botanical garden in Prague, who generously shared his data from a 2011 expedition to mainly Vietnam and Cambodia. The list contains over 320 species and information about localities and habitat. We are most flattered we are trusted with such a goldmine of information. The list and pictures have been checked by Dr A. Schuiteman. Dr Samuel Sprunger and Dan Christen at The Swiss Orchid Foundation in Basel have kindly helped the Orchid Ark to establish contact with the CITES headquarters (also located in Switzerland: Geneva). 1. Salvation picking permits – Australian model. 2. A website presenting certified orchid dealers and the Thai law. 3. Suggested strategy to suppress illegal trade. 4. Collaboration with other Thai authorities and Thai private organizations. We sincerely congratulate you on a very wise and forward-thinking project. We will consider some of our lab equipment and decide if, and what, we can contribute to your very worthy work. Our laboratory is a conservation-only lab working on more than 200 threatened and rare plant species from several different countries. Most of the species are orchids, which we produce in vitro and return to the natural habitats in the country of origin. We do field work in Madagascar, North America, Panama, Bermuda, and additional propagation and reintroduction for several other countries. We do all our research and propagation under permits from the home country as well as the United States. We have long advocated the very approach to orchid conservation that your project is carrying out and wish that all countries would take this very enlightened approach of creating arks for endangered plant species before more of their species disappear forever. Your work will ensure that future generations will experience all the physical and aesthetic benefits these plant species offer to the world. CITES Switzerland has ignored us, we have never received any reply, in spite of efforts from Kew Gardens and The Swiss Orchid Foundation. Bill Hunter who runs the Irish orchid discussion forum Species Specific (www.species-specific.com) has offered to donate 50% of the forum donations and 10% of his orchid sales to the Orchid Ark. We are most grateful for this generous help which shows we are all citizens of Earth. The orchid lab is up and running ‘kitchen style’. Until we get decent facilities we rely on low budget chemicals and tools, and we devote unpaid time. This morning we harvested and sowed seeds of Vanda liouvillei. Many more orchids have ripening fruits so the coming few weeks will be quite busy. Eric, seeing and reading this breaks my heart. wildlife and plants being exploited and stripped of its natural surroundings for profits is simply unacceptable. well done for voicing this to public and educate the buyers hence avoiding the extinction to the wonderful flora and fauna of which alot of people take for granted. Thank you so much for your encouragement. It is needed since we mostly meet ignorance. The 20th World Orchid Congress in Singapore in November has generously allowed the Orchid Ark a booth free of charge. This is a golden opportunity to discuss strategies for orchid conservation and to meet with the public and the orchid gurus of the world. We especially acknowledge Dr John Elliott at the Singaporean National Parks Board and Dr Alec Pridgeon at Kew gardens for their kind support. Eric Danell will give a talk at the venue, Kurt Keller from Chiang Dao will attend too and Peter Williams who has an orchid nursery in Mae Taeng will lead an orchid excursion. We offered a similar collaboration with the upcoming Royal Flora Show Rachapruek here in Chiang Mai. They demanded 50 000 Baht from the non-profit Orchid Ark to arrange for a similar booth, and so we decided to decline. We welcome Paul Whitehead as our latest orchid scout. He runs the site wildlifethailand.com which contains a lot of information and fantastic pictures of Thai bears and tigers. Since he spends a lot of time outdoors we are most grateful for his eyes gathering data about orchid habitats. Maejo Agricultural university has an orchid rescue unit too, although they already outplant their orchids while we have decided to wait until the threats are gone. We have tried to establish a collaboration which seems possible if the Orchid Ark pays them a fee. Anyone who wants to see their governmental project simply pay Dr Orachon 500 Baht. Dr Hubert Franz Kurzweil at the Singaporean National Parks board has generously sent the Orchid Ark some of his manuscripts. They contain identification keys on several orchid genera later to be published within the Flora of Thailand project. Since this is unpublished material we can not share it, but the keys will constitute a great help in our work of the Orchid Ark. We express our gratitude and admiration for his generosity. It took me years before my eyes opened. One recent example: a Karen man, a refugee from Burma, applied for a gardener position at Dokmai Garden. He explained that he already worked as a handyman for the local government. Unfortunately he had no working permit, and we tried to get that for him, but applications can not be submitted until 2012. So we had to explain to him he could not work for us, because we wish to follow the law. A few days later I asked Ketsanee what happened to the man, I felt sorry for him. She said that a police general had employed him (without papers)! The local government does not care about the law, and not the police either. If the politicians, officials and the law enforcing leaders do not follow the law, why should anyone? I can feel the temptation of not caring either, and I understand, no, I feel the mechanism of how corruption can spread in society. Do not blame corruption on poverty. Countries with hardly any corruption grew out of poor situations too, like Sweden, which was an agricultural society with poverty and starvation 100 years ago. The difference was that Sweden had law obedient leaders. This is based on a long tradition. King Carl XV (1826-1872) had a motto: “A country shall be built upon the law”. This motto was derived from 13th century law books, and they in turn were based on the oral laws by the vikings, kept in memory by the ‘man of law’ (lagman). The head of the government in the Faeroe islands is called ‘lagman’ to emphasise the importance of the law. Some intellectuals in India and Thailand try to persuade politicians to introduce systems to detect and thereby prevent corruption. The vague answer from the Thai parliament was ‘we are not ready’. I think the only harmonious way to deal with corruption, and to gradually exchange scamster politicians and officials with people with a true passion for the well-being of society, is to press today’s politicians to pass a law that will take effect in say ten years, affecting another generation of politicians. That means all level governmental employees can continue cheating (no change from now) while their successors will have to deal with auditors and transparency acts allowing journalists and the public to report scams. If a greedy person no longer can enrich himself with a governmental career, he will move back to business and then honourable successors can control him with the law. Another interesting remark is that I remember a Swedish taxation officer saying that he believed that 35% tax is acceptable to most people. He thought that at this level people would not cheat because they would still keep a large proportion of their income and still get free high quality schools and hospitals, infrastructure, national parks, botanical gardens and opera houses. This hypothesis is wrong. In Thailand people do their best to escape 7% taxation! This is not typically Thai, it is typically human. If the Swedes had not controlled each other they would probably still be a poorly educated and superstitious population. I am sure Thailand will develop to the better too. It is an ongoing process, but it is a great deal of unnecessary suffering for the generations alive now, and the wildlife and the orchids are in great danger because they are unprotected. With these examples I wish to explain why private Orchid Arks are needed until the world is run by functional governments. We have invited the new head of the Thai national parks, Khun Damrong Pidet, to give a talk at Dokmai Garden. We wish to show our appreciation of his efforts to battle corrupt national park heads and to preserve the Thai monuments (the national parks). In our opinion, he has the most important job in the Kingdom. He replied he is most flattered and will give a date for his talk when he knows his schedule better. He is currently involved in securing the rosewoods (Dahlbergia spp) and when that is done he is most happy to discuss Thai conservation efforts at Dokmai Garden. He said he will give a date in about two weeks. Another example of ignorance – no date was ever set. Tomorrow by noon I think we surpass 5000 monthly readers for the first time. However, such positive data has its price. Today we were hacked by an Arabic site who put a fake link into one of our orchid blogs. We have no clues about the content as it was all in Arabic, but we alerted WordPress and we have changed password and destroyed the link. If anyone sees a link or a text that is obviously out of context, kindly let us know ASAP. Last month (July 2012) we surpassed 8000 readers a month. The aftermath of the flooding has been severe. The world believes what is going on in Bangkok also goes on in Chiang Mai. Therefore many countries issued embassy warnings for visiting Thailand in general. This is the third year in a row with warnings about spending vacation in Thailand. The previous two years’ warnings were due to political violence, although Chiang Mai has been fine and safe all the time. Three consecutive years of poor visiting numbers has damaged us severely, and so I had to cancel my participation in the Singapore Orchid Congress to focus on mere survival. It seems easier to sell 800 000 Baht hand bags in the Four Seasons Hotel shop than finding people willing to donate 20 Baht for the survival of Thai orchids. I conclude that trying to find sponsors is a waste of valuable time, only one in ten million people cares if there are wild orchids or not. We therefore continue the Orchid Ark project as a 100% Dokmai Garden venture, and we simply finance the Orchid Ark activities via Dokmai Garden ticket sales. Working in the quiet saves time. In my darkest moments I feel we have already lost the battle, many Southeast Asian orchids will go extinct due to ignorance, but a few of us love the orchids too much to let them down. Human psychology interests me, but I do not understand a bit. It seems people are more interested in browsing a National Geographic magazine than actually visiting nature themselves. They are prepared to spend quite a bit of money on Avatar movie tickets, popcorn and soda, but not even a fraction of that amount to save the real Avatar world that surrounds them. I accept the fact that humans are more interested in dreams than reality, but how can we use that knowledge to preserve real life? Very very progressive thinking.I sincerely want to share your knowledge.I am a Orchid lover.Your co-operation will help to enjoy me. Thank you for kindly inspiring us. All good forces on the planet should collaborate. Education is essential, but so is action. Although quiet here for a while, the Orchid Ark keeps working rather than talking. The latest support is from Ekkehardt Schwadtke who runs the Lanta Orchid Nursery (www.lanta-orchidnursery.com) and the Orchid Garden Khaolak (www.orchidgarden-khaolak.com). We are grateful for his frank advice and comments, and for generously sharing some of his income with the Orchid Ark. We are also grateful to James Wearn and Andre Schuiteman at Kew Gardens for their kind support and advice, for writing a manuscript on orchid conservation and for James kindly visiting us before Christmas. They will also deal with CITES since we can not reach them. We also get a lot of reports from private people regarding the illegal market for orchids and the consequences of laws and regulations never enforced. We file your classified reports of historical reasons but if some of you dare sharing in public please do so here. There is an Orchid Ark Australia under formation and another Orchid Ark initiative in Colombia, so the idea is spreading. I’m becoming increasingly concerned at the illegal selling of orchids, both in Thai markets and, especially, on eBay UK & Ireland. While very few illegal plants are aimed directly at Irish users of eBay, they are able to purchase them very easily on eBay UK. Personally, I’m at a loss as to what other action I can take over here. It is basically impossible to contact eBay, they have made it extremely difficult. All I can do is identify illegal sellers on eBay UK and fill in a form requesting that they are breaking eBay rules. However, at no point are you asked why you think they are breaking the rules, but sometimes they must work it out because these sellers vanish. Unfortunately, they reappear under a new name and are allowed to trade. I suspect that eBay isn’t really concerned by these illegal traders as they generate quite a bit of profit for eBay and their sister company, PayPal. I truly would like an opportunity to to meet with, or at least communicate with someone in eBay about these traders and the great harm they are causing. Why are these traders selling illegally? One might ask, a very fair question. They are illegal because they do not offer or have access to export licences nor CITES licences, also this prevents them from obtaining the very crucial Phytosanitary certificate, crucial because it assists in preventing pests, virus and other diseases being exported to countries where plants are unable to cope with such infestations. When I ask these Thai traders if they would be willing to supply this paperwork, in fact some have started offering it with their plants, “if you wish”, they then ask ridiculous amounts of money. I started asking them this question several years ago to establish whether they were CITES registered in Thailand or not, they got wise to me and started answering that they can supply them, but the cost is so huge (in some cases I was quoted £150 and £100 sterling for paperwork that I know is a lot cheaper than that) that you are put off asking for it just to buy one plant from them. The danger these people cause are the destruction of CITES registered farms in Thailand and my business here in Ireland. The other real danger of course is to Thai farms. Unless this form of selling plants internationally isn’t stopped quickly there is the real possibility that CITES will step in and prevent Thailand, as a whole, from exporting. It happened in India, it’s happened in other countries, with bans being such long-term that many, many people lost their livelihood. It’s only in relatively recent years that the ban was lifted from India. Today, I was saddened to read a Facebook post of a Thai hobbyist who put up pictures of hundreds, if not thousands of orchid species on display in a Thai market. That person proudly proclaimed with delight that the plants had been taken from the wild by the mountain tribes and taken to the market on a Saturday for selling. I was further dismayed to read that this person wrote how they much preferred orchids from the wild than from the farm. I have written to that person but they are adamant that what they are doing is right and that I am wrong for disagreeing. I’m saddened by this attitude. I feel, sometimes, that I’m alone in this battle and that perhaps I don’t understand the Thai way of life, as this person tells me, and that I should just mind my own business and give up. Yes, the situation is serious for the orchids, and it is a serious situation for decent business owners. May we use your letter to contact the Queen Sirikit Botanic Garden and CITES Thailand, perhaps also Thai media? Another option is to elevate your comment to a ‘guest blog’? Based on Bill Hunter’s report above we propose a boycott of e-bay and Paypal. We have alerted the national botanic garden in Thailand, media and 30 orchid authorities worldwide. I bcc this e-mail to Ricky Ward (a Chiang Mai environmentalist), the Director of the Australian wildlife trade assessments, Andre Schuiteman at Kew, James Wearn at Kew, Tomas Freeth at Kew, David Mabberley at Kew, Alec Pridgeon at Kew, Hendrik Jacobs orchid scout in Chiang Rai, John Elliott in Singapore, Mark Sullivan at the Orchid Conservation coalition, Alvin Yoshinaga in Hawaii, orchid blogger Karma Forester in Sweden, Barry Natush at Nihon University in Tokyo, orchid grower Ekkehard Schwadtke, Jay Phal (IOSPE), Kurt Keller orchid scout in Chiang Dao, orchidologists Corien and Folbert Bronsema in the Netherlands, Zachary Buttel documentary photographer, Nayzaw Hlaing orchidologist in Burma, orchidologist Rick Lockwood in USA, orchidologist Ong Poh Teck in Malaysia, environmentalist Jessica Geheran in Mae Sot, Jim Watson President of the American orchid society, Rudolf Jenny at the Swiss Orchid Foundation, Johan Hermans Chairman of the Orchid Committee of the Royal Horticultural Society in UK, Charlotte Dupont EU protection France, Kenneth Cameron NY Botanical Garden, Henrik Aerenlund Pedersen in Denmark, Brett Moloney Australia and Margareth From director of plant conservation at the Henry Doorly Zoo, USA. Orchid grower Bill Hunter from Ireland recently posted a comment on our website ‘Last Days of the orchids’ where he reports seeing hundreds if not thousands of Thai orchids collected in the wild for sale via e-bay. Kindly forward the idea about a boycott of e-bay and paypal to your friends, colleagues, environmental organizations and media. The mere threat of a boycott may very well force the managers to omit orchid trade and thereby we have closed another door to the criminal trade of wild orchids. Eric Danell and Ketsanee Seehamongkol, Dokmai Garden, Chiang Mai, Thailand. I had hopes that the area in Mae Chan could be an area of interest to nature lovers. Many rare and seldom seen birds are/were regularly observed including the Northern Hobby and Harrier, Amur Falcons, Chestnut Winged Cuckoo among them. This year I have not seen a single raptor, Large areas are being planted with rubber, the annual burning between January and May is devastating. Resorts and private houses are mushrooming and these resorts buy birds to put them in cages for large amounts of money (a black throated laughing thrush fetches about 4,000 baht) therefore netting etc is rampant. The wild Jungle Fowl are breeding with domestic stock. The situation is bleak not only for orchids but also for the whole natural environment. The animals are already gone. I admire what you are doing but wish that Thais, Burmese, Laos and above all the Chinese would also take similar initiatives. To put this into context the area referred to above is 12 kms west of Mae Chan, at 600m in hilly country, and refers to the birds in the area but is also relevant to all flora and fauna. We are sorry to learn about this deterioration in the Chiang Rai province. I think what is needed is a northern Thai nature conservation society with members who can teach the public. The board has to be people who speaks English and Thai, and finding such people is a problem. I have several people in mind and shall ask them if they are interested. We can support with experience from clubs in the west, but I think there should be no member fee. For decades Chatuchak market in Bangkok has been notorious for its trade in endangered species. After complaints have been made, the Thai authorities put a thin cover of veneer over the activities in the market. After a short interval this cover comes off and it is business as usual. Each Wednesday and Thursday Chatuchak market is open as a plant market only. During a recent visit it became obvious that Chatuchak has forgotten that Thailand is a CITES signatory. Truckloads of bush collected orchids are for sale in Chatuchak market again. A few years ago it was ‘fashionable’ to mount bush collected orchids before selling them. This is not done anymore: masses of plants are lying on the pavements and are eagerly bought because they are cheap. Not cheap are the ancients growths that have been removed as a clump from a tree limb and are bought by the ‘high-so’ as they drive by. Only once did I ask for a price. Several dozen flowering specimens of Habenaria medusa were for sale and they wanted 120 Baht (or 4 US$) for one plant. None of the plants was in a pot. By my knowledge, Habenaria medusa has not been recorded in Thailand. Probably these plants came from Laos. It is also possible that the illegal collectors have found the species in Thailand, and maybe extirpated it, before it has been officially recorded. This is guessing but a similar documented case is known. One day a small amount of the beautiful butterfly Bhutanitis lidderdalei emerged in Doi Suthep national park. The local hunter-gatherers caught them and sold them to the tourists. This species has never been seen again in Thailand. It seems that not willing to learn from past errors is a part of Thai culture. People in Europe buying wild collected orchids off e-bay are breaking the law, as I assume they are imported and exported without proper CITES permits. If these people get caught they can expect a big fine or even a prison sentence. Alerting CITES and TRAFFIC (http://www.traffic.org) may help. The majority of Thais do not believe they made an error. Making money on the forests is considered a good thing by most Thais. CITES only regulates trade of endangered species between nations. The domestic trade is regulated by Thai law. What is needed is information in Thai language. This is stunted by lack of knowledge, lack of interest and lack of funding. A campaign using commercials at the movie theatres would teach the Thai middle class about the alarming state of the Thai orchids. Judging from the commercials the wealthy Thai brewing companies are more interested in supporting Spanish football teams than Thai monuments (the flora of Thailand). Information directed towards the tens of millions of Thais with rudimentary knowledge about everything seems like an impossible task. Poverty has to disappear first. However, the green tourism card could become valuable. Instead of the perverted weed watching in Mae Hong Son (innocent tourists pay money to see yellow South American weeds (Tithonia diversifolia) covering clearcuts) one could teach tourists to request seeing native orchids in native habitats. That would be like selling the same orchid over and over, similar to the transformation of whale hunting to whale watching. We need the educated world outside Thailand to teach their citizens about the alarming state of the Southeast Asian orchids, and ask them not to buy orchids from e-bay and ask them to request environmentally sound tourist destinations. A couple of years ago I was crossing the range separating Phrae province from Amphoe Nanoi in Nan. There is a National park along the road and Hmong farmland. I came across a small stand of no doubt planted Mexican Daisy. I took out my hoe and destroyed all the plants. Perhaps we could organise a Posse of nature lovers to do the same in Mae Hong Son early one morning with TV cameras in trail and perhaps erect a sign Forest Restoration Weed Control for The King. Yesterday a delegation representing Gum Hak Doi Suthep (Ricky Ward), Dokmai Garden (Eric Danell), Chiang Mai University (Dr Prasak Thavornyutikarn, Environmental Science Program) and Big Tree in Town (Orarick Sriwong) met with His Excellency M.L. Panadda Diskul – Governor of Chiang Mai, and his colleagues Khun Jantima Dateputhat (The Chiang Mai Strategic Planning Office) and Khun Prasit Sukoanaphraphat (Head of the Natural Resources and Environment Office, Chiang Mai). The aim of the 90 minutes long meeting was to discuss how the Chiang Mai government can improve the awareness of northern Thai biodiversity. In this context we discussed the importance of expanding the green segment of tourism, and the importance of marketing the national parks with educated guides and bookstores. If local people can make money on showing and even explaining the true Thai nature they would care for biodiversity and the forests. Such a promotion should start already within the city of Chiang Mai, making it clear to the visitor he visits a city different from all other cities in the world. Planting more native tree and bamboo species on governmental land is important also because Thai people are losing knowledge about what is natural. Frequently South American visitors to Dokmai Garden have remarked that Chiang Mai ‘looks like home’, so I make sure they leave our garden with impressions from truly Thai plants and animals. Another suggestion was that when the government invests in orchid ornaments of their governmental parklands and office buildings, they may wish to consider using native Thai species from legal growers rather than exotics or man-made hybrids. We also proposed that the Governor could encourage arborist education and city employment of certified arborists, to avoid improper treatment of city trees leading to their slow death, causing destruction of houses and cars and loss of lives. The Governor remarked this fits well with the ASEAN proposal to make Chiang Mai an educational hub. 2. The Chiang Mai urban forests Declaration which calls for planting of many local species of trees along roads and elsewhere to restore some of the lost biodiversity of the plains. Mr Orarick Sriwong presented the Big Tree in Town Project which is mobilizing thousands of Chiang Mai people to plant trees on their own land and aims to see 15,000 trees planted over three years. He also showed slides with text in Thai showing examples of damage, death & destruction of trees on government managed land, ranging from office precincts and roadsides to recreation reserves. This slide show will be made available for viewing in the government sector to explain the issues. The Governor gracefully promised to discuss these issues within his own Strategic Planning Office and to set up a committee of advisors. He also suggested that he could forward the proposals to the Minister of Interior Affairs so other parts of Thailand feel inspired too. He further explained that previously it was easier for the Governor to implement directives from Bangkok, but with the new political system with more levels of authority, implementation is harder. To my understanding, local district governments are basically good if the population is well educated. Unfortunately, there are many cases of local corruption in Thailand, where subdistrict heads use national Treasury money (‘Bangkok money’) for their own private consumption rather than developing libraries, infrastructure and garbage pick-up. Such subdistrict heads are elected based on how much cash they pay uneducated peasants for their votes. Until the population has reached an educational level to appreciate and promote true democracy, the Governor’s office is an essential cornerstone for a positive development initiated by the intellectual elite in Bangkok. The challenge for the well educated Thai minority is huge, also because corruption can be found at high levels. Personally I felt excited about meeting so many intelligent, well educated and visionary Thais at yesterday’s meeting. We also mentioned the great efforts made by the new generation of young Thai scientists at the Queen Sirikit Botanic garden. All these people carry on the visions of fallen heroes like Dr Boonsong Lekagul and Seub Nakhasatien with honour. Feeling you are not alone but that good and even powerful forces share your ideas is important to get the strength to carry on with your daily struggle. Being the father of two young Thai citizens it is my duty to contribute to the preservation of Thai biodiversity, an amazing, important and valuable monument. Eric Danell (a full blog with pictures and links is found here). branch had been cut to seel the orchid. The purchase was at the Kad Long Chork at Sansai, nor far from Chiang Mai city. He says many are for sale along the roadside at Mae Orn at a cheaper price. He thinks they come from the forest. There was a report that the police nabbed a pharmacist selling illegal drugs in Chiang Mai recently by having an agent posing as a genuine buyer. Can they do this with the illegal orchid trade?